We’ll get to all of that, but just lets take a moment to appreciate the original classic by Anna Sewell. 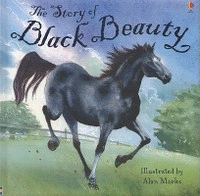 Set in Victorian England, it tells of a young, sprightly and handsome horse called Black Beauty. As a young horse, he begins his career as a carriage horse for a wealthy family. The wheels of time turn, he injures his knees and is then resold a couple of times as a working horse. Overworked, whipped the poor horse just fell in the street one day, to be rescued by a vet and then adopted by a family who treat him well and keep him for the rest of his life. The novel was published in 1877 and was instantly successful. Sewell, who had been hurt at 14 and was unable to walk, was a good rider and rode a horse or a carriage everywhere she went. Her novel, written in the form of an autobiography, brought the mistreatment and overworking of working horses in spotlight, so much so that the use of the painful “bearing-rein” which was common at that time, was abolished. Animal rights activists of the time started distributing the novel for free in stables, there was a veritable public outcry against the enslavement of beast, such was the effect of Sewell’s work on the public psyche. Anna Sewell herself, died in 1878, only five months after the first publication of her book. The Story Of Black Beauty is an adaptation of the original 1877 blockbuster, targetted at introducing the story to kids of the 4-6 age group. The book has been beautifully illustrated by Alan Marks. The paintings on each page carry the distinctive dreamlike quality of watercolor, almost as if its a projection reverberating down the corridors of time. The artwork and the adapted story, together create quite an impact on both, the parent reading the story and the kid that is hearing the story. My daughter and I found the book at a library in Pune. She picked it up because she loved the picture of the black horse with a star on his forehead. I was immediately transported to my school days when I first read the book. The kid was silent for a minute after reading the story. Then she asked me to read it to her again, and again. Over the next few days, after hundreds of reading sessions, started the questions about why humans domesticate animals. Then started the questions about why humans are cruel to stray animals. That gave way to how animals must think about humans. Those were the most difficult to answer, since she started drawing parallels between all animals, be it horse, stray dogs, cats, you name it. I now have a very ardent, outspoken supporter of animal rights at home. To sum it up, this adaptation is the perfect way to introduce the story to a young child. The text is simple and easy to follow for children who have just started to read themselves. The pictures are really worth many a word and a child younger than the target audience of 4-6 can also appreciate the book because of them. For the parent reading the book to the child or discussing it with them, you just opened up their minds to new ways of thinking.